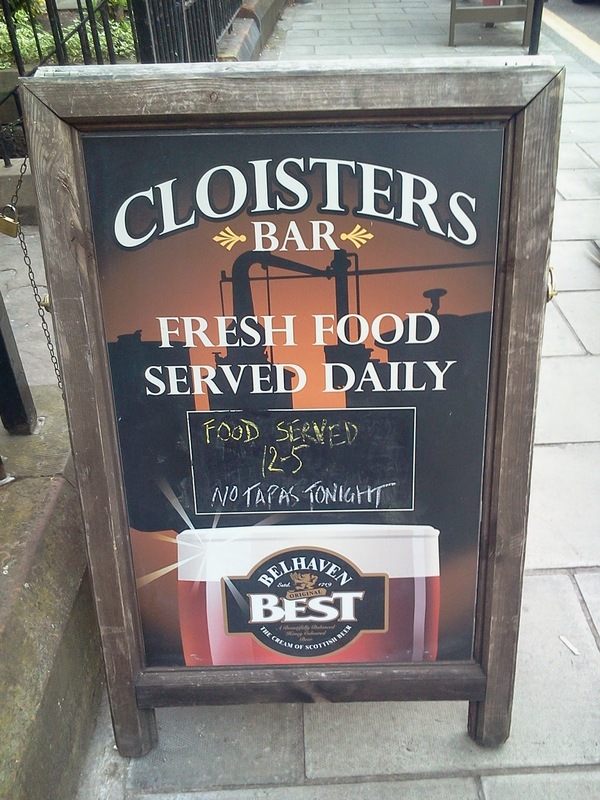 Cloisters was by far the most pub like pub experience I've ever had. I immediately felt like one of the locals when I entered this well maintained former parsonage. It was fairly busy on Saturday afternoon, and there were several people enjoying some drinks and food from the limited lunch menu. I went up to the bar, and looked over their available cask and draft beer. After some contemplation I ordered an Alechemy Bad Day at the Office and grabbed one of the open seats. I sat back and relaxed as it seemed like the only appropriate thing to do. The interior was quite nice and all the stone and wood gave it an old and comfortable atmosphere. I spent some time staring at the wood stove and wondering if they use it for additional heat in the winter. The bar was divided by a wall which separated an area with some seating and the bar from where the entrance and the rest of the seating is located. A few people would head outside frequently to smoke. Besides that people seemed to just sit back and pass the time. One aspect that would have made me as a stranger feel a bit more welcome would have been beer menus with descriptions at the tables and bar. 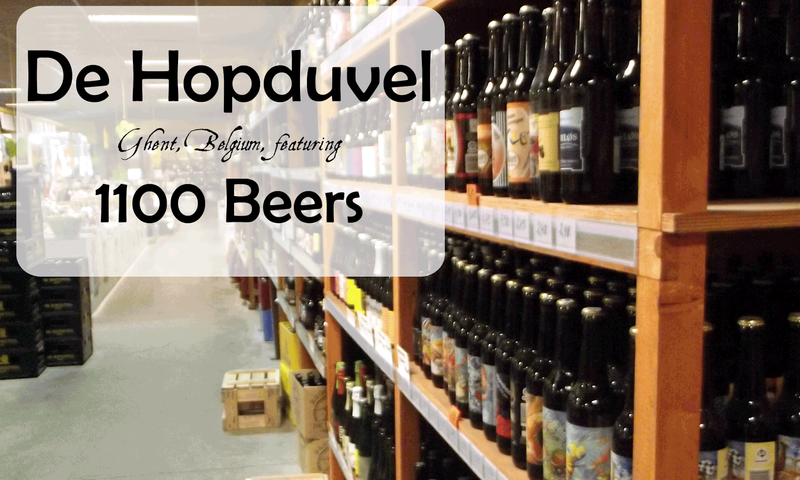 I'd read about most of the beers and brewers before, but it is never realistic to know all the beers you'll encounter at a bar in another country. The staff was overall friendly but didn't make any indication that they were interested in talking about beer. I'm sure they would have been willing to talk if I struck up a conversation though. 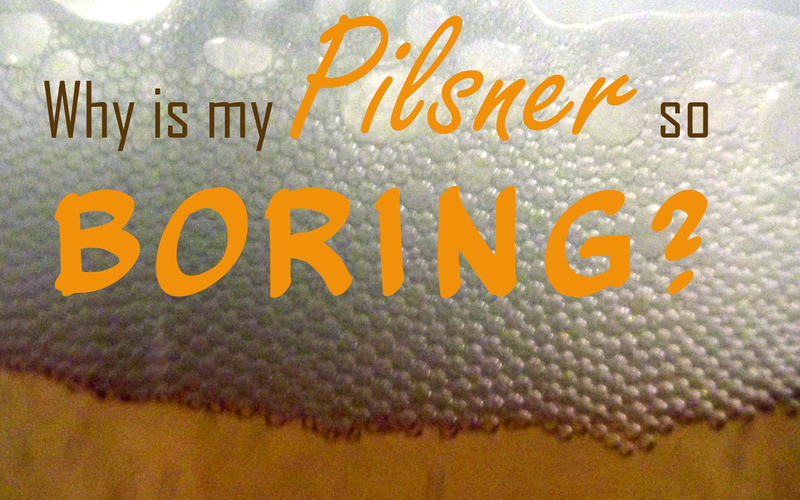 As some time passed I decided to have another beer. 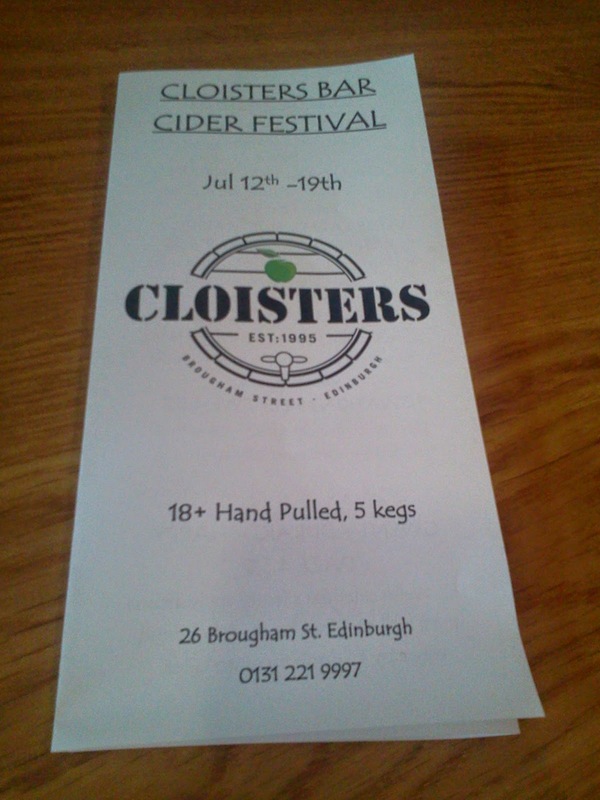 The cask selections were limited at the time, because Cloisters was having a week long cider festival. Also another one of the casks had just ran out so there was even one less available. I was ready for something different after having drank plenty of cask ale the day before at the Scottish Real Ale Festival, so I decided to go with a bottle of Camden Town Pale Ale. We also ordered some hand cut chips and a cider for my lovely drinking companion. A bit after I sat back down the new cask was ready, and it was an Espresso Stout from Summer Wine which I would have gladly have tried despite growing a bit weary of cask ale. Sometimes that is the way the biscuit crumbles though. Cloisters is the kind of place I wish I lived around the corner from. The welcoming and relaxed atmosphere make for the kind of place you want to be a regular. Since they offer, "5 guest casks and 1 guest keg", in addition to their standard lineup, there should always be something knew to try. 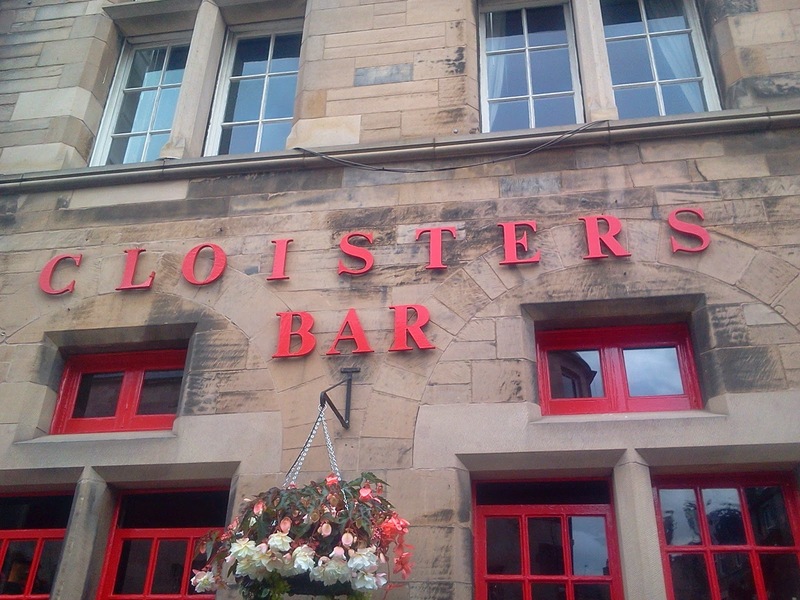 I'd definitely go back if I find myself in Edinburgh again, and maybe one day I'll be lucky enough to live near a great pub like Cloisters.